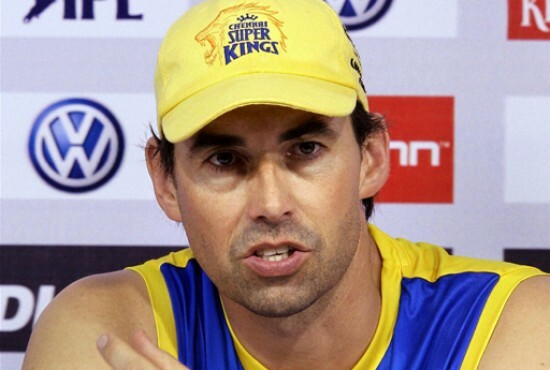 The coach of Chennai Super Kings, Stephen Fleming, is convinced that his team has a lot of pressure in the IPL 2012 as previously they were two times successive champions. The Chennai Super Kings won the first Indian Premier League title on April 25, 2010 against the Mumbai Indians at Dr D Y Patil Sports Academy, Mumbai. They scored 168 runs for the loss of five wickets in the allocated 20 overs as Suresh Raina remained unbeaten for 57. The Mumbai Indians were restricted to 146 runs after losing 9 wickets and the Chennai Super Kings won the final by 22 runs. The final of the IPL 2011 was played between the Chennai Super Kings and the Royal Challengers Bangalore, on May 28, 2011 at MA Chidambaram Stadium, Chepauk, Chennai. The hosts piled up 205 runs with five wickets still in hand, Murali Vijay smashed 95 and Michael Hussey posted 63 runs. The Royal Challengers Bangalore managed 147 runs for the loss of 8 wickets and lost the final by a huge margin of 58. The Chennai Super Kings appeared in the inaugural game of the IPL 2012 against the Mumbai Indians on April 4, 2012 at MA Chidambaram Stadium, Chepauk, Chennai. The match was witnessed by the packed stadium and the home crowd turned up to cheer their team in the encounter. Their team exhibited a dismal performance with the bat and were bowled out for mere 112 runs with one ball to spare as Suresh Raina top scored with 36. The Mumbai Indians smashed 115 runs in 16.5 overs, Richard Levi plundered 50 runs and the visitors won the match convincingly by 8 wickets. The Chennai Super Kings won the second match against the Deccan Chargers by a substantial margin of 74 runs on April 7, 2012 at Dr. Y. S. Rajasekhara Reddy ACA-VDCA Cricket Stadium, Visakapatnam. The match was won mainly because of an outstanding all round performance from Ravindra Jadeja who scored 48 runs and grabbed 5 wickets. They played their third match of the tournament against the Delhi Daredevils on April 10, 2012 at Feroz Shah Kotla, Delhi. The batting of the Chennai Super Kings failed once again and they scored just 110 runs with two wickets left as Dwayne Bravo was the highest scorer with 22 runs. The Delhi Daredevils thrashed 111 runs in 13.2 overs, Kevin Pietersen remained unbeaten for 43 off just 26 balls with 2 sixes and 3 fours as Virender Sehwag scored 33 from 21 deliveries with the assistance of one six and 4 fours. The Delhi Daredevils triumphed with a big margin of 8 wickets and that was the second defeat out of three games for the Chennai Super Kings. Stephen Fleming was confident that after the initial setback of losing a couple of matches, his team is capable of regaining its form and will prove its worth in the matches to come.